Summer master bedroom ideas in ethereal white and dreamy blush pink that are subtle and he won’t mind one bit! In the summer months barely there colors are just perfect for reflecting the light. I’ve used white bedding for many years and for many reasons. The primary reason is cleanliness because you can see exactly where the dirt is on white. That makes it so much easier to clean, just like my Cameron white twill slipcovered sofa. But I digress, as that’s in our beach home living room. Today I’m talking about pale tones in a summer master bedroom. I’m going for a much more subtle and washed look these days and gone are the days of too much. Want to see what I’m talking about? This was a styled magazine shoot in my home about 10 years ago I think. I DID NOT do the styling or photography. I have a lot of props stored away in my garage though, and this was the result. It’s too much and one’s eye does not have anything to focus on. I still have many of those pieces, but you don’t see them all out at once. I remember my hubby coming home from work that day and asking if the house was always going to look this way. Hah! Let’s talk understated now. 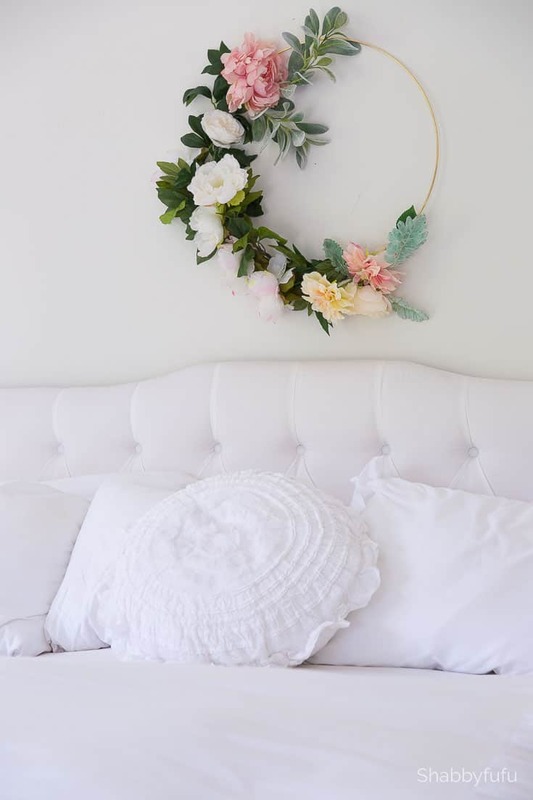 I actually grabbed this wreath off the front door and just for fun hung it over the bed. It’s the kind of whimsical thing that you can do on a dime, literally. It was not an expensive project to make at all. You can find the oversized hoop HERE and the flowers HERE. I made them for the front doors at the request of my daughter for her wedding reception at home. See the wedding details HERE. Sometimes I think that bloggers and readers over complicate decorating. Today’s summer master bedroom ideas are simple and don’t require a lot of planning or thought. 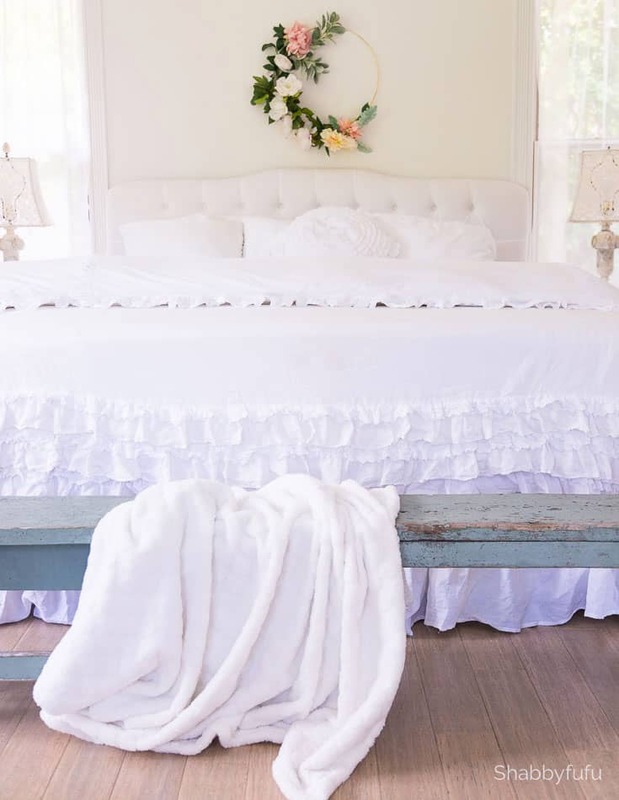 White sheets (THESE are what I recommend for summer) and a few pastel touches will soften up your room, guaranteed! I would probably change out some of the things in this bedroom if I had an unlimited budget. That isn’t the case and I’m a careful shopper, so the ruffles and white tufted headboard are staying put. Because they are white, I still find the look understated and calming at the end of a busy day. A ceiling fan is an absolute MUST here and I believe wholeheartedly in comfort. You know how gold is trending in modern homes these days? That ceiling fan is 25 years old and we’ve never seen the need to change it out, so it’s back in apparently. 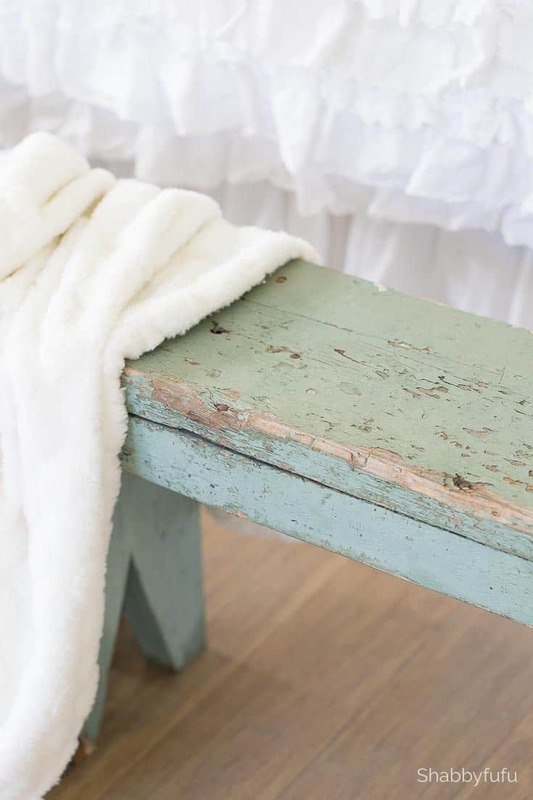 As a vintage lover I mix in old pieces like the chippy green benches with new. They aren’t always in here, but I mix things around and shop my home (and garage) to change things up. Some day I would love to change out the vintage night stands along with the white tufted headboard (as mentioned). That will have to wait, but they are slight in form and faint in color. If you have heavy pieces that bother you…paint them white for a whole new look! The painted vase is part of a pair that my mom gave me a few years before she passed away. A little something sweet and nostalgic to remember her by now. Our home is a good size, but lacks storage with no basement or attic. In one corner we have a dressing screen to provide more. It’s become a spot to silently stash our suitcases, as I don’t want them in the non-air conditioned garage! The screen was a flea market find from years back, covered in dark victorian wallpaper. I recovered one side with white lace to blend in. In a perfect Instagram world it’s not anything that anyone would want to see, but it works. The fireplace mantel is opposite the bed. Sometimes I have it bare and naked while othertimes dressed with a few seasonal goods. 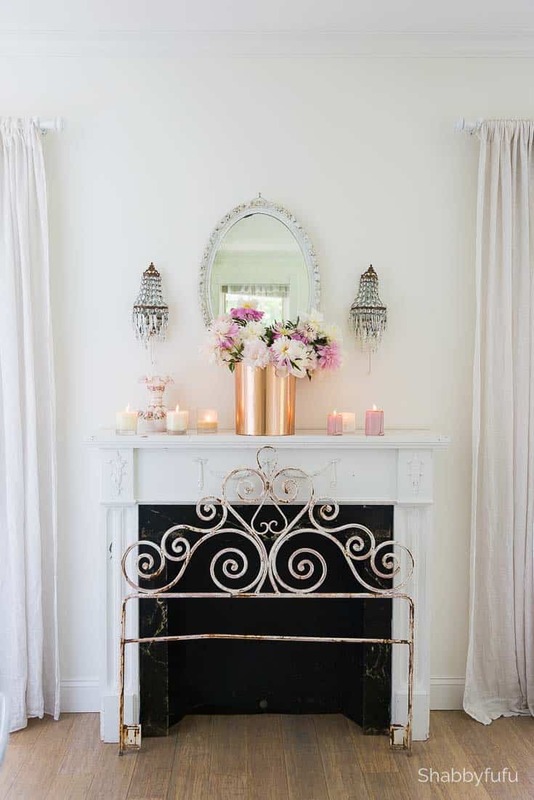 The “fireplace screen” is an old crusty vintage iron headboard with layers of old paint. You can often find old headboards and shutters at yard sales that work for summer master bedroom ideas. Feminine and fun and nothing permanent. My husband never even notices and also realizes that nothing is permanent and will change again soon. Finally, just have fun with your decorating. As I often say, your home is like a living and breathing thing and will constantly change as you change. Happy summer! Love everything about this room! 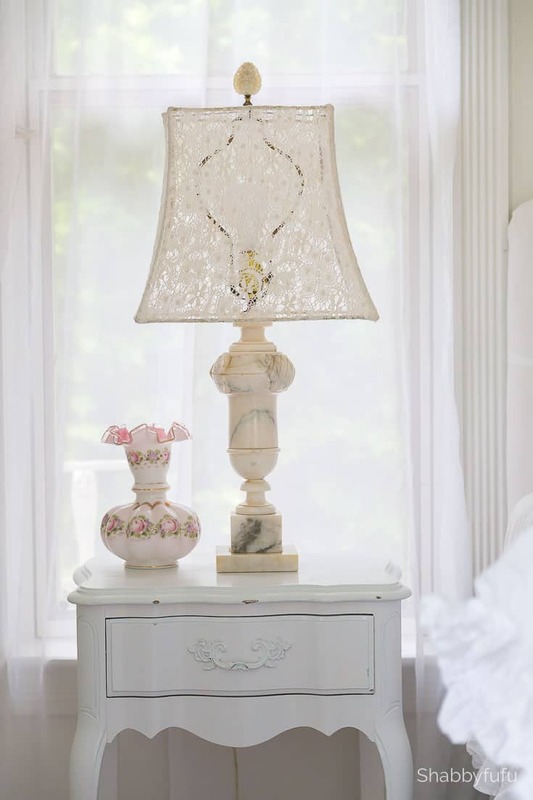 Now I want a lace lampshade! The room does look beautiful. Screams light, airy and summer. Not sure how my husband would like all the white but he would get use to it. Beautiful ideas for the summer! It would be a dream come true to have unlimited budget when making over a room! It’s really important that you have loads of fun working on a project like this. Gorgeous inspiration! I have always preferred a little less than most which made me feel out of the loop! I’m so glad decorating is a little less complicated but just as beautiful these days. Awesome ideas! 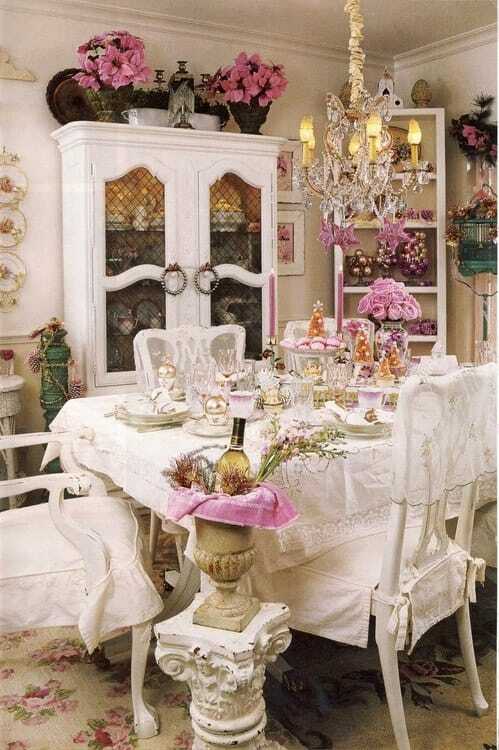 I totally love it, the room looks like it came from a fairy tale book. Love the white it is bright yet soothing at the same time. Arranging pieces that add to the charm and those florals makes the room special. I love the idea of light sheets! Mine are dark brown, would be nice to get a new set for the summer months! I love pale tones, it’s easy to work with and you can add different pops of color if you please. I haven’t worked on our bedroom in a while. I should totally redecorate for the summer! It’s gorgeous! So fluffy and pretty and clean! I love the ruffles. 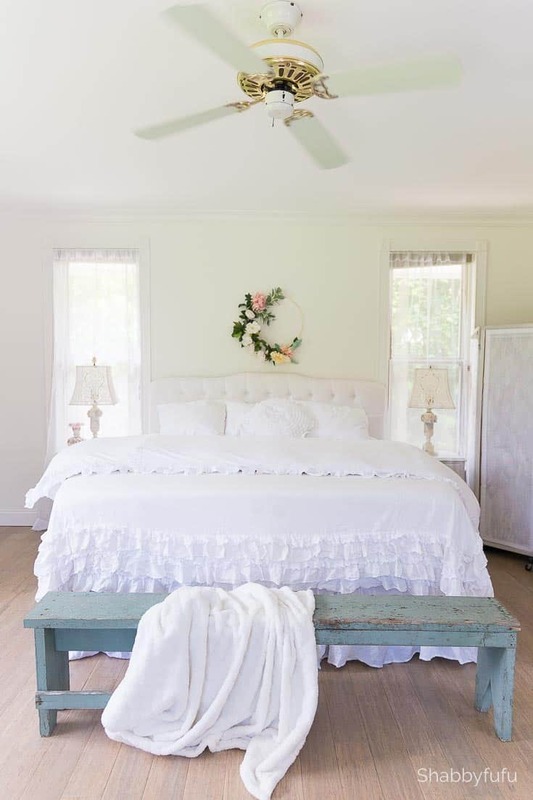 I am a sucker for a crisp, clean white bedroom and this one looks fantastic! 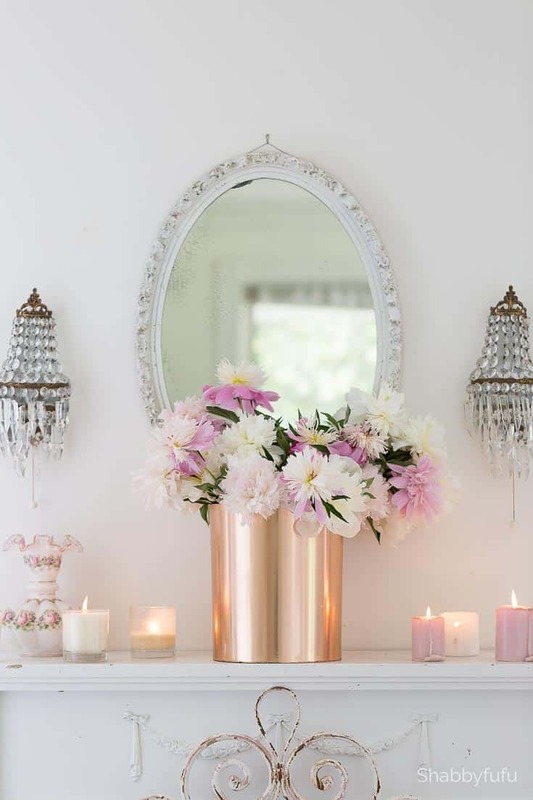 I also love those copper vases you featured. Great look! I am a big fan of the understated look when it comes to decorating. It just looks so effortless and stylish! It is beautiful. I love the hidden storage and that bench. But all that white scares me. These are such great ideas! I just love the way all white looks and those flowers mixed is just perfect! I so love this, very relaxing and inviting. The addition of that bench is pretty cool too. 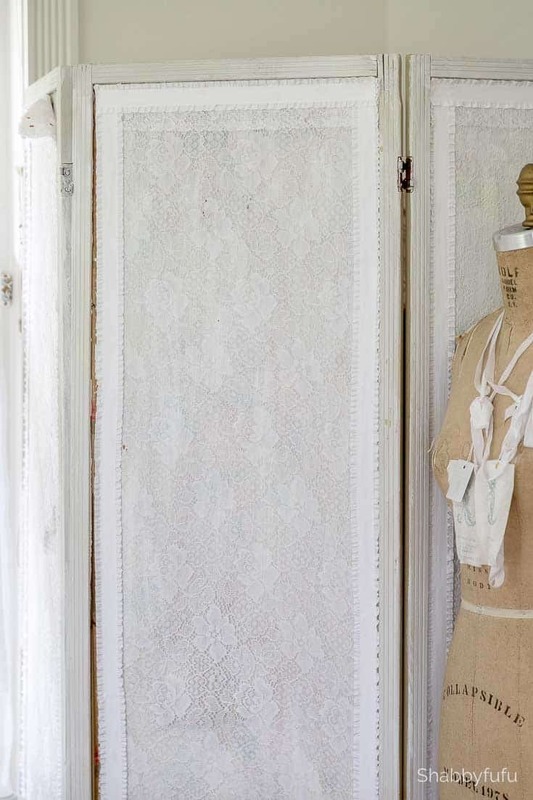 I love the Victorian look but have not incorporated into my home decor. I love how you’ve pulled these pieces together to make a gorgeous master suite. This style is so perfect for summer. I love it! So light and so fresh! These are some awesome tips. I need to have you come over and decorate! The photoshoot in your home is stunning! I love the flower hoop in your bedroom. It adds a little something extra cute! The fireplace is amazing. I want to decorate my new home with all these light and airy colors. I am really loving this room! I can’t wait to buy a home and decorate!